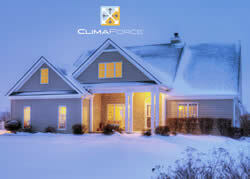 ClimaForce™ Insulated Siding. Advanced All-Weather Protection. ClimaForce™ insulated vinyl siding not only adds a thick layer of insulation around your home, it gives the outside of your home the look and feel of solid wood siding. With added insulation, you can reduce your home energy costs and enjoy a quieter, more comfortable living environment. It’s a smart investment that pays you back with a lifetime of energy efficient, low-maintenance beauty.